You can click here to send me an email. These are some mods & doors that I have written for Synchronet. 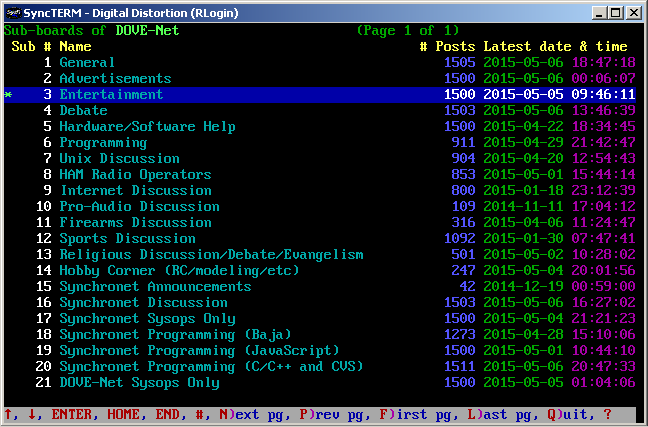 These may be freely downloaded and used by Synchronet BBS sysops. For each application listed, you can click the button to show or hide its screenshots. This page contains all screenshots. All the SlyEdit .cfg files and SlyEdit_Taglines.txt from the ctrl directory: Place those in your sbbs/ctrl directory. 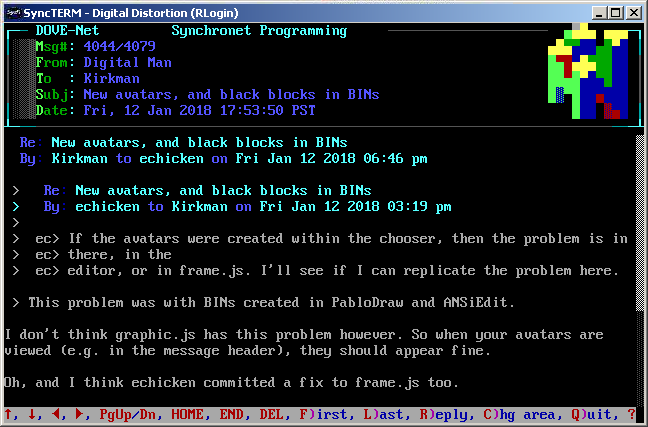 There is also SlyEdit documentation on the Synchronet wiki here and here. This is a message reader script that provides an alternate message reader interface for Synchronet. The reader interface allows scrolling the message up & down, navigating through the message list using the left & right arrow keys, listing messages in the sub-board, and changing to a different sub-board. Message searching & scanning and batch message delete are also supported. Lightbar interfaces are supported for the message list and area chooser. 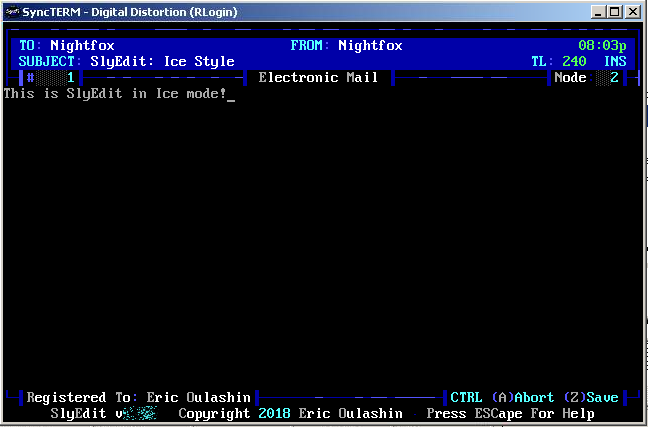 If the user's terminal does not support ANSI, the reader will fall back to a more traditional user interface for the reader, message list, and area chooser. Version 1.17 supports the new voting feature and avatars in Synchronet 3.17, and also added proper filtering of messages (such as not displaying messages marked for deletion, etc.). 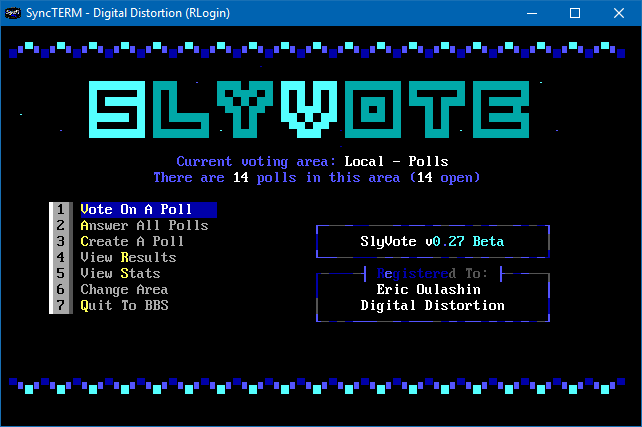 This is a voting booth door for Synchronet 3.17+ that allows users to post and vote on poll topics, and view the results. 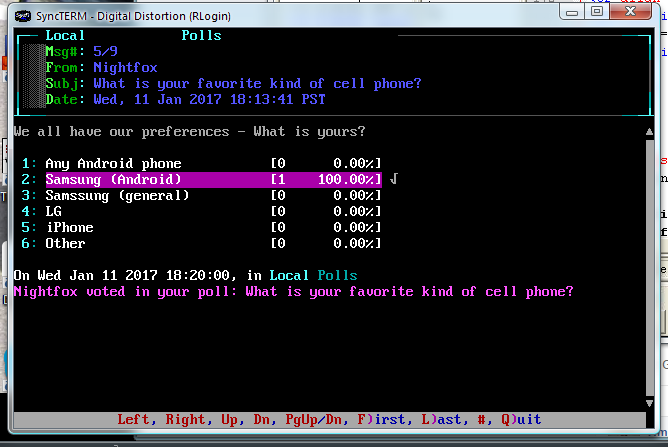 It uses the messagebase poll voting feature added in Synchronet 3.17. This is a file listing mod with a lightbar prompt and a custom header above the file listing. 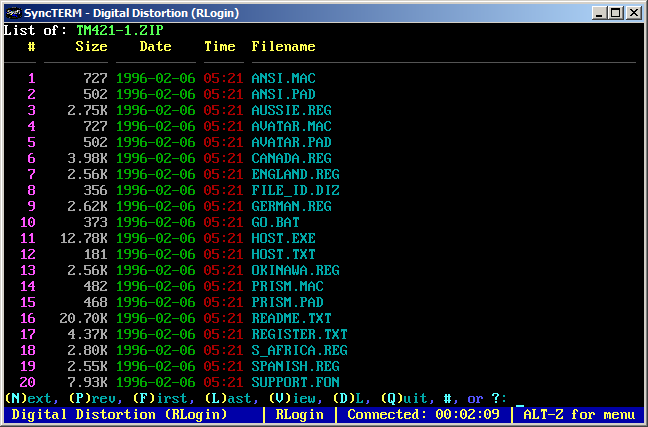 This is styled similarly to WarezTag!, a file listing door that was made for RemoteAccess (one of my favorite file listing mods in the 1990s). 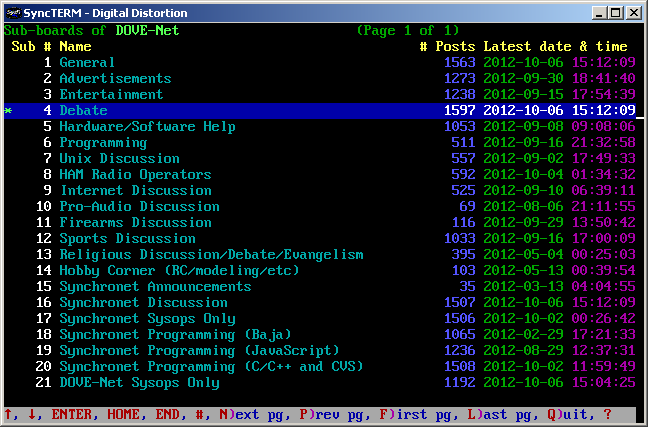 This file lister is written in Baja and was based on Vanguard's SpyLister v2.0B. This is a script that lets users list files inside of archives (ZIP, RAR, etc.). The user can navigate the list (using a lightbar or traditional user interface), view files inside the archive, and download files from inside the archive. The user can also list the files of archives within archives. This is a login matrix that is designed to be configurable to your own liking. 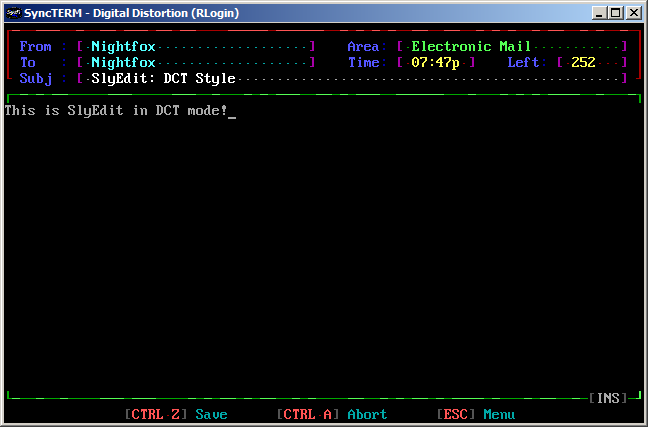 A "login matrix" displays a menu of options when the user connects, as an alternative to the more traditional login procedure. 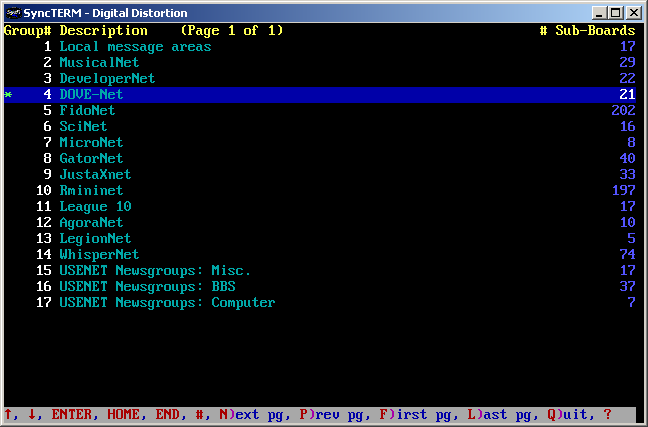 Matrix menu options include Log in, New user, Retrieve password, Email the sysop, Page the sysop, and Disconnect. Easily configurable with an editable configuration file, as well as matrix "themes" that can be added in their own directory with their own configuration file specifying background filenames, menu placement, menu colors, etc. 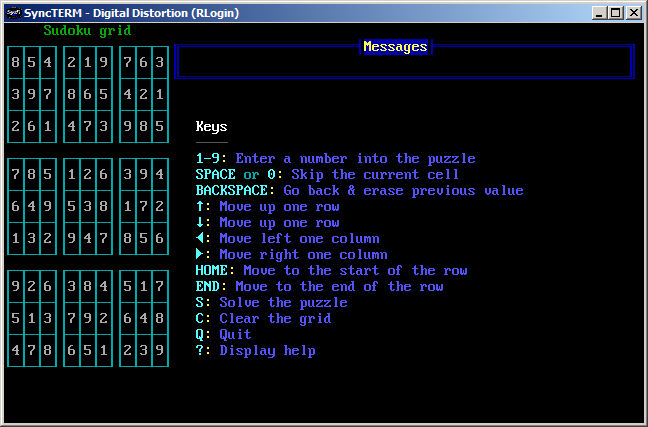 This is a door program that can solve Sudoku puzzles. It uses a brute-force algorithm that can solve any Sudoku puzzle. The algorithm came from Wikipedia. 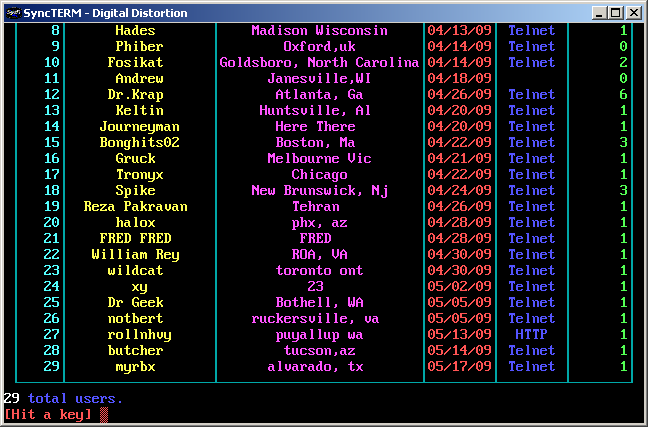 This script lists the day's callers in a colored, formatted table. 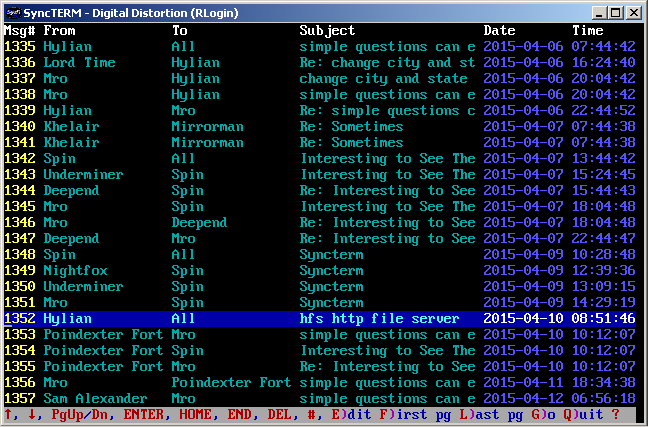 The list can be sorted alphabetically, and the colors can be easily changed by the sysop (by editing the script). This is a designed as a replacement for Synchronet's Last Few Callers functionality. The script can also generate the caller list in an HTML table for use with the web. 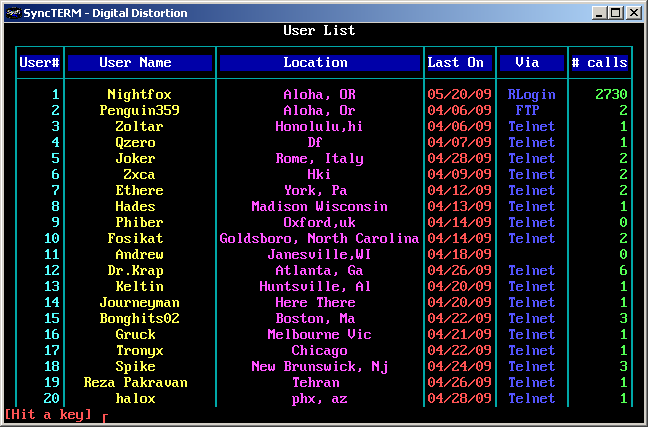 This script lists all users in a colored, formatted table, similar to the List Today's Callers script. 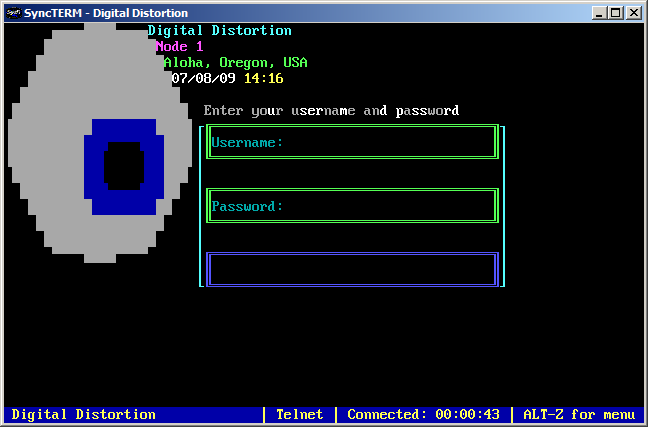 The colors can be easily changed by the sysop (by editing the script). This script also supports listing the users in a web page. A script that displays animated pause prompt text. Customizable with various options via a configuration file. 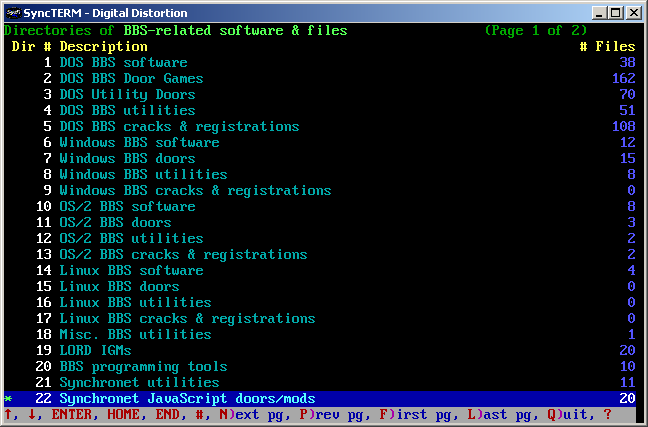 Many BBS doors require a separate configuration file for each node. Often, the only difference in the configuration files is the path to the drop file. This is a tool designed to ease the setup of the node configuration files for a BBS door - You create the first, and this will make copies of it for your other nodes with the correct drop file paths. Win32, DOS, and OS/2 versions are included, and the source code is included so it can be compiled on other platforms.